Exclusion Day is Wednesday, February 20, 2019. Exclusion day is Wednesday, February 20, 2019. 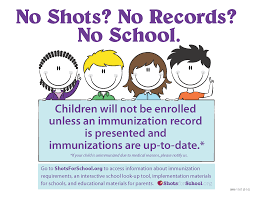 If your child has not had all required immunizations, they will be excluded from school starting, February 20th. Please make sure your child is complaint. If you have any questions or concerns please call Reva Farmer at 503-359-2586.